The state of North Dakota doesn't even know how many acres of cropland have been damaged by saltwater spills, a byproduct of the local oil boom. Daryl Peterson's farm has been in his family for as long as he's been alive. His father passed down the 2,500-acre spread, just a few miles from the Canadian border in Antler, North Dakota, nearly 50 years ago. He and his brother Larry have been farming it ever since. But now, in his 70s, Peterson finds himself forced to protect his family's legacy. For the past two decades, Peterson and his wife Christine have been dealing with the spillage of saltwater — a byproduct of oil production — on their land, which grows peas, soybeans and various types of grain. Almost 40 years ago, they signed a contract with an oil company "land man" who came to their house and said there might be oil on their land. In 1997, two spills covered dozens of acres with more than 50,000 gallons of saltwater. A decade later, another 21,000 gallons of saltwater spilled. And since then, though their land never produced much oil or oil revenue, the Petersons say they have seen another 10 spills. They claim these spills were never properly cleaned up. Peterson says it's become his "life's mission" to get some justice for his land, so he and his wife are suing the oil company, Petro Harvester. "It's incumbent on me to protect my property to the best of my ability for myself and my family," Peterson said. "Enough is enough." Over the past decade, the biggest in a series of oil booms has transformed North Dakota, reinvigorating an economy that was largely known for its agricultural output. With an influx of new workers and jobs, North Dakota has consistently had one of the lowest unemployment and highest labor force participation rates in the country. But this prosperity has not come without consequence. Oil production has brought with it an ecological problem that threatens farms that have been in the same families for generations. A thousand miles from the nearest ocean, the fertile black earth of North Dakota is being destroyed by saltwater, which is brought from beneath the surface by oil and gas drilling. Landowners, like the Petersons, have to deal with the mess. North Dakota landowners who spoke with NBC raised concerns about the reporting and cleanup of saltwater or "brine" spills. They cited late reporting or nonexistent reporting of spills, a failure to return their land to the original condition, as the state requires, and a lack of compensation for lost farming revenue. Some owners and organizers are also working towards finding the total acreage of land that has been damaged — a number the state has never calculated. They question the state's ability to keep up with the boom, to enforce the regulations that are supposed to protect their land and hold oil companies accountable, especially with oil prices rising again and North Dakota seeing more oil and gas production. An analysis of state spill records shows that there have been more than 800 saltwater spills that weren't contained on well pads in North Dakota in the last decade. Don Morrison — executive director of the Dakota Resource Council, an organization that advocates for protecting the state's agricultural economy — said these spills represent "an aggregate of all the heartache and problems" producers in the state face. Saltwater spills have plagued North Dakota since the latter part of the 20th century, when North Dakota experienced its first oil boom. They are more damaging than oil spills on land because of the contaminants they leave in the soil, and they are harder to clean up. Though oil companies typically promised landowners in their drilling contracts that they would clean up spills, it wasn't until 1981 that state law began requiring oil companies to restore damaged land to its original condition. An unregulated industry in the 70s and 80s caused numerous saltwater spills, which led to what researchers call "legacy brine." Legacy brine disperses and migrates throughout the oil-producing regions of the state decades after the original spill, said Miranda Meehan, environmental stewardship specialist in the Animal Sciences Department at North Dakota State University. While the state is trying to clean up legacy brine, it has to also deal with new spills. In 2002, North Dakota experienced another major oil boom, this time in the Bakken, a geological formation in the western part of the state. Oil production hit an all-time peak in 2014, with oil at more than $100 a barrel, and the state saw its highest ever annual total of non-contained saltwater spills — 138. After 2014, oil prices fell, and the number of spills dropped to about 80 a year. But the price of oil has been steadily rising for the past year, from about $45 a barrel in June 2017 to more than $70 a barrel now. Oil and natural gas production is growing again. While North Dakota has enacted new laws to enhance the reporting and cleanup of spills since the 1970s, landowners have criticized the state for not fully enforcing its rules and regulations. Morrison and Peterson said that North Dakota politicians and state agencies are wary of regulation, which may come at the expense of landowners. "Right now, we're in this mentality of over-regulation and so, anything that is a regulation is a no-no," Peterson said. Peterson thinks North Dakotans haven't learned from their mistakes during boom years and will repeat them, lamenting that the state will "so regret not trying to protect precious natural resources." Katie Haarsager, public information officer for the North Dakota Department of Mineral Resources, painted a different picture. She said the North Dakota Industrial Commission, one of the bodies regulating the oil and gas industry, fully enforces all rules and regulations "in a way that benefits and protects the rights of all stewards of the land." Cleanup: Original condition or 'that's good enough'? A few years ago, Avner Vengosh, professor of earth and ocean sciences at Duke University, went to North Dakota to investigate the impact of brine spills on soil. "Basically, all the vegetation, all the aquatic life at the point of the spill were destroyed and becoming lifeless," Vengosh noted. "The high salt and the high metals and the high radioactivity that characterizes this wastewater causes a kind of local ecological disaster to the place where the water is released." Meehan said that once saltwater has spilled on soil, the only way to get that land productive again is to clean up the spill — reclaim the land. To state regulators, reclamation means the company doing the drilling must return a spill site "as closely as practicable to its original condition," Haarsager said. But the Petersons' lawyer, Derrick Braaten, believes there is an enforcement issue. "The Oil and Gas Division [of the Department of Mineral Resources] has a regulation that says you need to restore the land to its original condition. … I think anyone understands what that means," he said. "When you get into the details, you start to understand how that's not actually happening." NBC News reached out to several oil and gas companies, including Continental Resources, Denbury Resources, Summit Midstream Partners and Crestwood Midstream Partners, for comment. These companies, which have either had the most non-contained saltwater spills or the greatest amount of saltwater spilled during the past decade, did not respond or declined to comment. Kari Cutting — vice president of the North Dakota Petroleum Council, a trade association that represents 520 companies in all parts of oil and gas production — said the companies her organization represents are committed to returning land back to its original condition after a spill has occurred. Three different oil companies have spilled saltwater on the Petersons' farmland during the past four decades. The Petersons' breach of contract lawsuit alleges the company that has held drilling rights since 2011, Petro Harvester, is responsible for the cleanup of the spills. Due to contamination and cleanup, more than 30 acres of the Petersons' land have been out of commission for years. The Petersons' lawsuit, which will begin its jury trial next March, claims Petro Harvester used two methods to reclaim the land — evacuating the soil and installing a drain and sump, which collects the contaminated water. Both methods were ineffective and made things worse, the lawsuit alleges. Using electroconductivity readings, which can indicate salinity, the Petersons found that the land around various spill sites had a higher concentration of salts than before the spill. 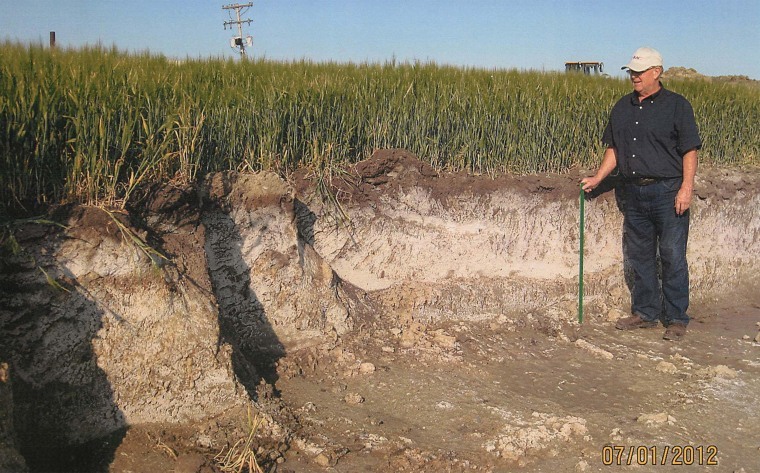 Moreover, Braaten found in depositions with state regulators that instead of returning the land to its original condition and salinity they restore it to a condition deemed appropriate by regulators. "That's clearly not original condition," he said. "Their attitude is essentially, well that's good enough." Neither Petro Harvester nor its legal counsel has responded to multiple requests for comment. In court filings, Petro Harvester denies that its remediation did not comply with state standards or made things worse, and denies that it owes the Petersons money. In addition to cleanup, North Dakota farmers have also expressed frustration with the actual reporting of spills. On multiple occasions, landowners have found spills on their land that had been previously unreported. In May, the Bismarck Tribune reported that employees of the Zavanna oil company failed to report spills dating back to October 2017. The company fired three employees responsible for the failure, which resulted in one 33,600 gallon spill onto land. Bill Suess, spill investigation program manager for the state Department of Health, said it's rare that companies do not report spills at all. According to a protocol established in 1981, companies have to inform the state of a spill within 24 hours of discover of the incident. To report a spill, the company provides its own estimate of the size to the Department of Health via an online form that it cannot update. The public will not necessarily learn if the spill turns out to be bigger. Peterson said this can make it possible for companies to "minimize" the actual amount of saltwater spilled. For example, in July 2011, Petro Harvester reported a 300-barrel brine spill in Bottineau County. However, a Notice of Violation from the Department of Health revealed the company actually removed more than 52,000 barrels of water by September 2011. Suess acknowledged that the spill volumes online were not always accurate. "But in the long run, it doesn't affect how it's cleaned up or that it's cleaned up...It doesn't affect our overall goal," he said. "Obviously, you in the media are going to be interested in that because that's the story. But, the story to us is not the volume, it's that it was spilled and that it was cleaned up." State agencies can issue fines up to $12,500 per day to oil companies that have failed to report spills on time or conduct improper cleanup, Suess said. He added that it's "very rare" that the total amount of a fine is actually collected. The customary amount is about 10 percent of a fine, Braaten said, which was the case for Petro Harvester in the Petersons' case. It may be less. In the 12 months from July 2017 to July 2018, oil and gas companies paid just $3,294 in fines for saltwater spills, according to Haarsager. Over the past decade, the state has collected about $1,314,164. During that same period, there have been about 865 non-contained saltwater spills. Haarsager said that fines and penalties are fully collected unless the North Dakota Industrial Commission believes suspending a portion of the fine will inspire better compliance from a company. "In North Dakota, they've come up with this idea that if we forgive the fines, we'll get compliance," Braaten said. "My response to that is … [t]hey should follow the law because they know you're going to enforce it if they don't." When it comes to dealing with oil companies, Donald Nelson, a DRC member from McKenzie County who grows grain and raises cattle, said that landowners were often on their own. He added that he wished there were guidelines when negotiating damages for lost revenue on damaged land. "I guess in the end, it comes down to a negotiation between the affected party and the oil company. But they really have the upper hand," Nelson said. Braaten said contracts between landowners and oil companies typically address cleanup of spills, though some do not. He added that for contracts that do include cleanup, there is a range for how comprehensively they address spills. Even if spills are addressed in a contract, oil companies may not comply, which is what the Petersons allege in their lawsuit. It claims that Petro Harvester has not paid the family for the harm to their land and that the state has been negligent in ensuring the reclamation of the land. Cutting said that oil companies are committed to cleaning up their spills. "The industry is only leasing the surface and drilling underground to extract the resource, but the land continues to be owned by the landowner who is going to want to see it returned to its original condition, is going to want to see spills prevented," Cutting said. "Every company in our industry is dedicated to that landowner relationship." Daryl Peterson's neighbor Matthew Peterson (no relation), a farmer and rancher who has also seen thousands of gallons of saltwater spilled on his land, suggested more state regulators as a potential reform. Suess said that there were four full-time spill investigators, two part-time and nine volunteers who come in once every few months. Currently, there are about 160 non-contained saltwater spills that still need follow-up, in addition to daily saltwater spills and contained saltwater spills. "No government employee is ever going to say he's got enough people. So, yeah, we could always use more people," he said. "We handle it with the staff we have." Suess added that if oil goes back to $100 a barrel, the department will definitely need more help due to increased production. In July, the cost of barrel of crude oil reached $74.11, a three-year high, and the state is breaking records in oil and natural gas production. Landowners worry North Dakota will repeat its mistakes with saltwater spills. But Fin Dooley — a lawyer and coordinator for the Salted Lands Council, a group that wants the state to take full responsibility for all contaminated acreage — is optimistic about the future of North Dakota's farmland, which supplies the whole nation with wheat and cattle. "I think as long we can get the beer drinkers tuned in and the people that eat hamburgers, we're going to win, aren't we?" Dooley said. "Who doesn't care about beer, bread and beef?"